Concert poster collector and Nirvana specialist Scott Mussell is seeking this flyer advertising the bands cancelled show in Norman, OK at Rome XC. The show was scheduled for May 12, 1990 but Nirvana never showed up, but the supporting act Angry Son still played the show. "I'm always looking for posters with dynamic graphics and this one utilizes a classic photo” Mussell said. The image by Kurt Cobain’s then girlfriend Tracy Marander was also used on the cover of the “Blew” EP. "Both the flyer and handbill have a killer headline ‘Experience Nirvana’" Mussell states adding "Even though they didn’t play this gig I think this flyer captures the spirit of the DIY mindset and as a native Midwesterner I'm very eager to obtain any Nirvana material from the Midwest." 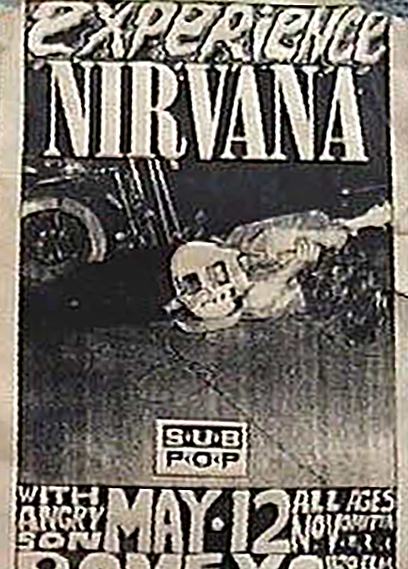 Mussell pays top prices for single owner Nirvana flyers for his archive and accepts flyers in any condition. If you have this poster, the handbill or any other examples of Nirvana concert flyers contact Mussell at 515.707.7250 anytime or by email at srmussell@me.com.